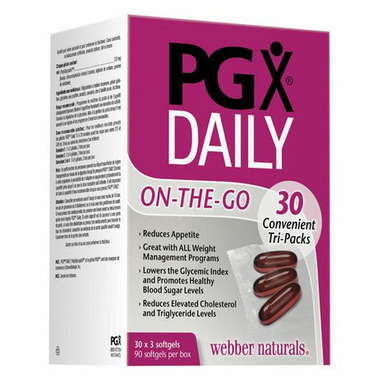 PGX DAILY from Webber Naturals is a breakthrough in dietary fibre that makes it easy to maintain normal blood sugar levels and a healthy weight. When you take PGX with or before a meal, it creates a feeling of fullness for several hours, helping you eat less without feeling hungry. Highly purified water soluble polysaccharide complex manufactured using the proprietary EnviroSimplex® process: Konjac-mannan(Amorphophallus kojac) (root), xanthan gum, sodium alginate. Non-Medicinal Ingredients: Softgel (gelatin, glycerin, purified water, carob, annatto, titanium dioxide), yellow beeswax, non-GMO sunflower lecithin. Recommended Purpose: Reduces appetite by promoting a feeling of fullness. Helps lower the glycemic index. Promotes healthy blood sugar levels. Helps reduce elevated total and LDL cholesterol levels.